In its fourth year, the Taos Art Glass Invitational makes New Mexico a prime destination that attracts artists, collectors and visitors from all around the world. This year’s event includes multiple exhibitions, lectures, demonstrations and experiences that are collectively titled “Taos Celebrates Contemporary Glass: Fifty Years of Art Innovation”. The lead exhibition is the Taos Art Glass Invitational, a juried exhibition featuring the best in contemporary studio glass today. 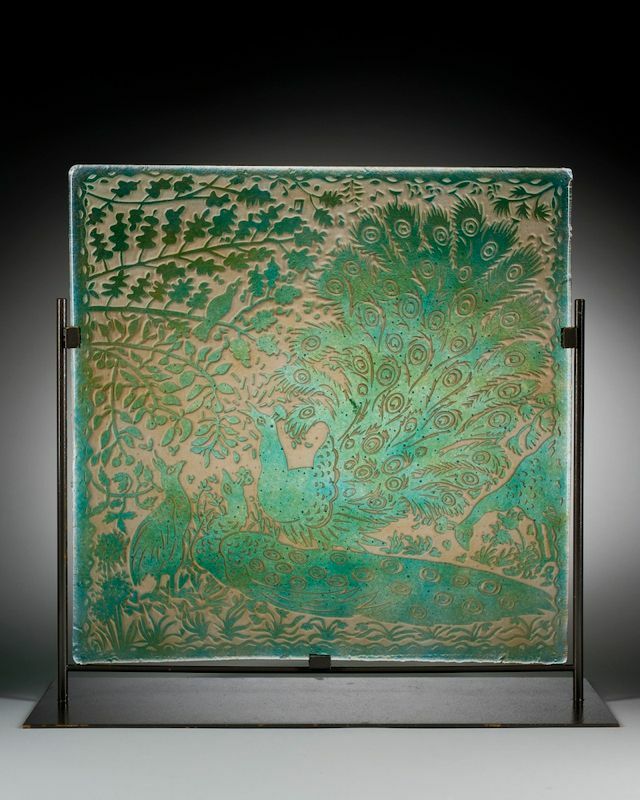 The series of exhibitions, self-guided tours and educational events celebrates the unique contribution of the American Studio Glass Movement to the field of contemporary art. Other special events include “Light up the Night,” September 28, from 7-10 p.m. when Taos Plaza will be lit with glassblowers at work. 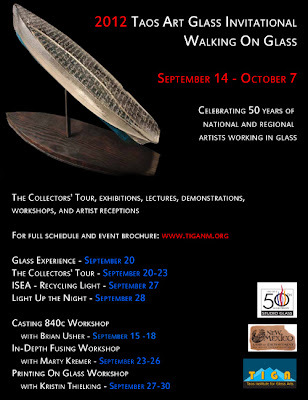 On Thursday, September 27, a live installation art project called “Recycling Light” will be created at Taos Institute for Glass Arts. 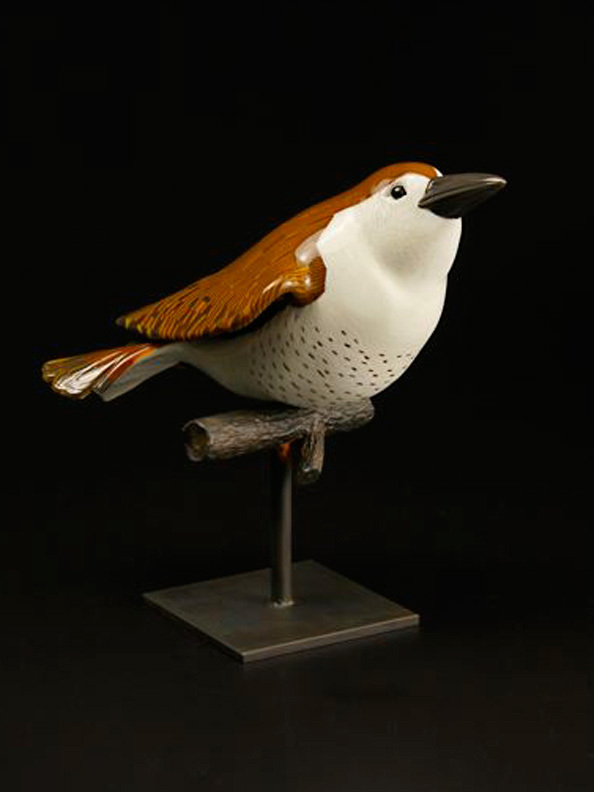 A Collectors’ Tour will be held September 20-23. This celebration of glass is produced by TIGA (Taos Institute for Glass Arts). 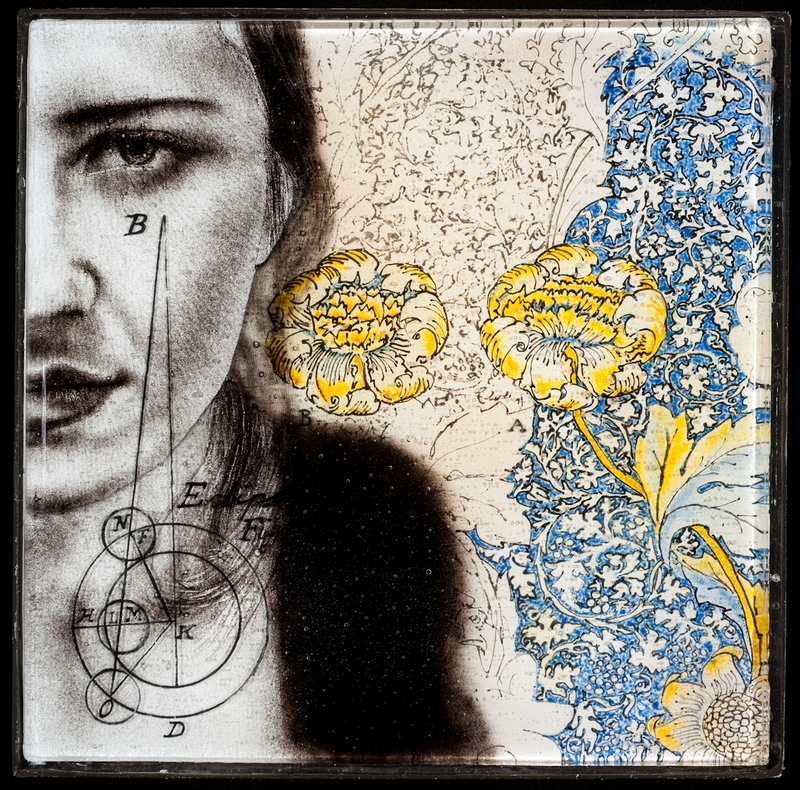 Sean Hennessey often incorporates electronics into his cast glass works. 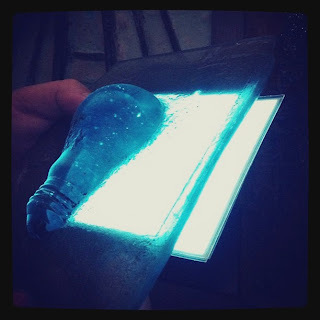 Here he is testing new el-wire (electroluminescent) sheet for his panels. Artist Sean Hennessey is in da house! (Or at least da Studio!) working on a new series of cast glass/mixed media panels. Fresh from his successful show at Blue Spiral Gallery in Asheville and Artomatic, Sean continues to move forward in his artwork. Sean is kilncasting slabs of glass for his upcoming shows, including “Constructing Content” with fellow Washington Glass artists Erwin Timmers and Erin Antognoli that opens Dec 1 at the Kline Gallery in Frederick, MD’s Delaplaine Arts Center. Opening the kiln, Sean removes the plaster from cast glass. 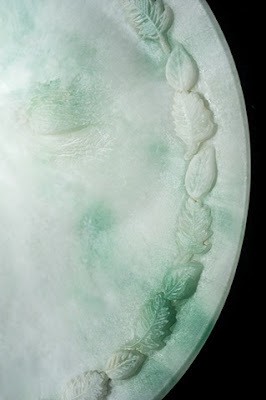 Sean’s glass is formed using dry-plaster casting technique captures the detail of his fingerprints. An exhibit featuring Washington Glass School sculptors Erwin Timmers, Sean Hennessey, and Erin Antognoli. The mixed media sculptors combine photography, steel and glass. More will be published online soon! Sean appraises the composition of panel after annealing. On September 14 from 6-8pm, DC’s Georgetown will have an evening Gallery Walk that will showcase art galleries located on the upper Wisconsin Ave – near Book Hill Park. 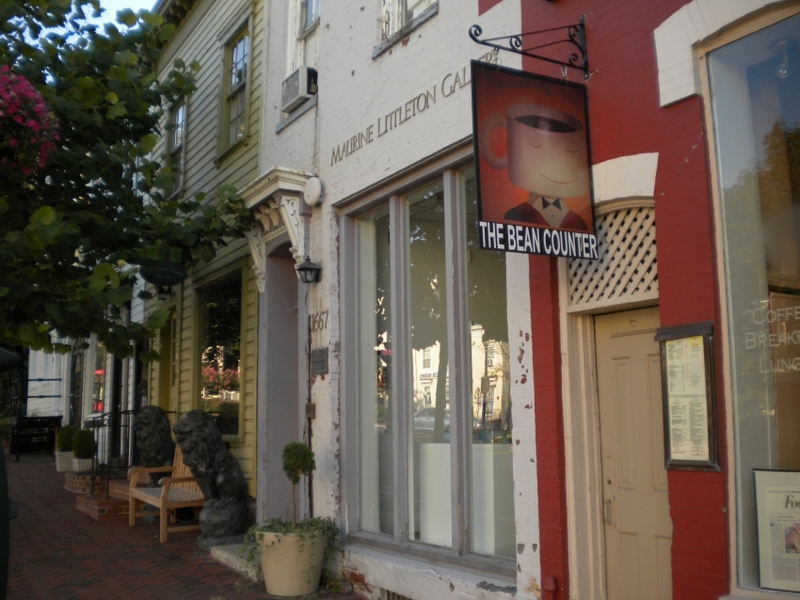 Maurine Littleton Gallery will feature artwork by local DC-area artists including Allegra Marquart, Michael Janis and Drew Storm Graham at the gallery for the September 14 Book Hill gallery walk event. The artists on exhibit at the Maurine Littleton Gallery bring to life an otherwise cold and transparent medium in their glass art, which flaunts dimensions and depth of color unmatched by other art media. 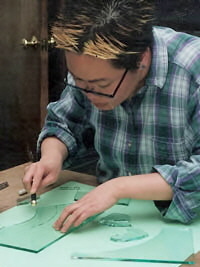 Contemporary glass art by local artists has been displayed at the gallery since its opening in 1984; each work reflecting new interpretations and uses of a range of traditional craft media. New York’s Heller Gallery will be presenting a solo exhibition of Marc Petrovic – in a show titled ‘Avian’. Marc often uses bird imagery as a metaphor for relationships, parenting, home, shelter, and geographical identification. In his most recent series, Avian, he takes a closer look at his subject as he pixelates, deconstructs and then reconstructs the figure. To create his sculpture, Marc first creates a murrini flat patterned sheet that is later worked in the hot shop, using the roll-up process. 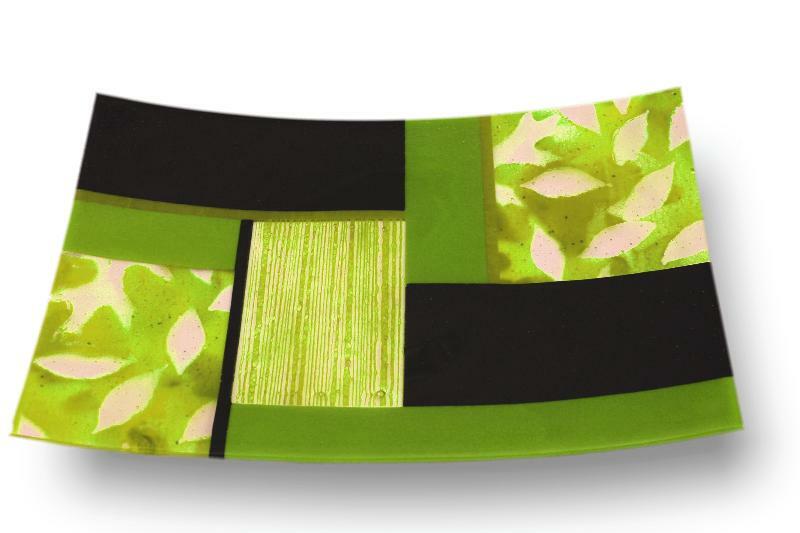 The flat fused panel is a result of painstaking detailed cutting and firing of flat colored sheets of Bullseye glass. 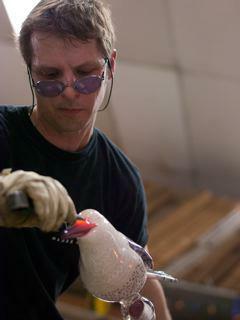 Marc Petrovic with Jonathan Chapman work in the hot shop to shape the glass into a dimensional piece. Using Bullseyecolored glass, Marc cuts the sheet glass, arranges and fuses it into abstract patterned slabs (beautiful as an abstract flat plate). He then uses the “Aussie Roll-up” technique to transform them into incredibly detailed blown glass sculptures. If you are familiar with Marc’s work, his knowledge of anatomy of (seemingly all) living creatures comes into play, as his work easily travels between obsessive, meditative labor, visionary abstraction and poignant representation. He has been working on this show for most of the past year, and it really shows in the beauty and detail of the work. Marc Petrovic “Avian” Hot-sculpted and blown Bullseye murrini roll-up. H 9, W 15, D 10 in. 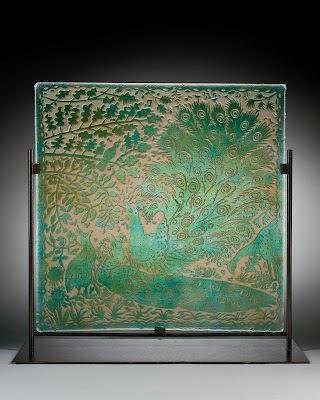 Marc and his work will be featured in an article in the upcoming Fall 2012 print edition of GLASS Quarterly magazine. Click HERE to jump to a set of photos on Facebook of his process. Demo: Saturday, September 8, 2012 11am at Brooklyn Glass to benefit Urban Glass Studio. Debra Ruzinsky at her show opening at the Brattleboro Museum. 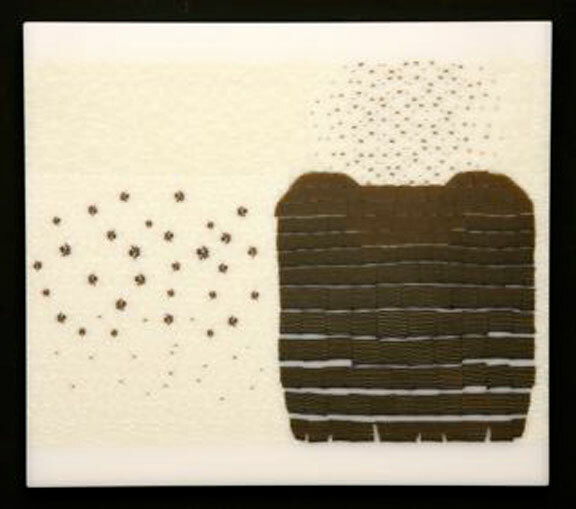 Images of Deb’s work are also featured in the book ” New Technologies in Glass“, by Dr. Vanessa Cutler. Debra works in kiln-cast glass and mixed-media, producing objects that mix distopian and utopian visions, investigating belief and meaning. Her new series that takes an oblique look at objects imbued with personal meanings. Referencing memorabilia, collectibles, and luxury goods for display, these objects form a fragmented portraiture, with discrete elements creating implications of a whole. There was an exciting art discovery recently at Indiana’s Evansville Museum. A painting had been misidentified as a stained glass piece and kept in storage for 50 years turned out to be something much more valuable: an original Picasso. A GLASS Picasso. There are over 30,000 works of art are at the museum, and many spend time in storage.The Picasso wouldn’t have been there so long if the museum would have known it was a Picasso to begin with. Museum officials say it was cataloged as art inspired by a design for a Picasso painting but credited to an artist named Gemmaux. That name turned out to be plural for “gemmail,” which is the type of glass used in the work. Donated to the museum in 1963, the painting had been misidentified as another stained glass piece - by an artist named ‘Gemmaux’, and kept in storage for 50 years. “When the piece came in, the documents associated with the gift indicated it was by an artist named ‘Gemmaux’, and it was from a design inspired by a Picasso oil painting,” said museum curator Mary Bower. 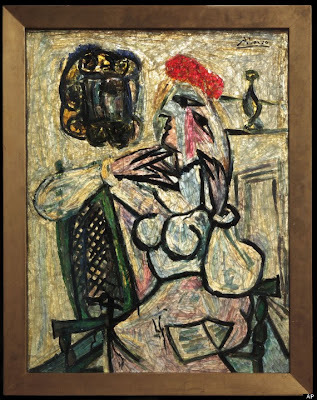 It wasn’t until this past February, when a New York auction house called with questions about the piece, that Bower and others found out it wasn’t just inspired by Picasso, it was created by him. Picasso discovered the Gemmail in 1954 through Jean Cocteau at the Malherbe art studio. Fascinated by the light, the material and the transparency, Picasso contemplated the offer to illuminate all his master pieces. He made his first Gemmail art work “Femme dans un fauteuild’osier” in 1954. The Evansville Museum says the piece titled “Seated Woman with Red Hat” was donated to the museum in 1963. Enormous is also a way to describe the price tag that museum officials say would come with keeping the art safe it if was put on display. “The value of the piece makes it prohibitive for us to insure it. Then we would have all sorts of considerations about staffing all sorts of electronic additions, to what we do with our facility that just makes it impossible to keep, and we’re so sad about that,” Streetman said. 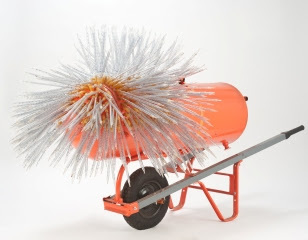 >Dave D’Orio, (owner of our sister glass school, hot shop DC GlassWorks), was named as one of the eight finalists for this year’s prestigious Trawick Prize. The website for the Trawick uses one of Dave’s works as its banner headline. 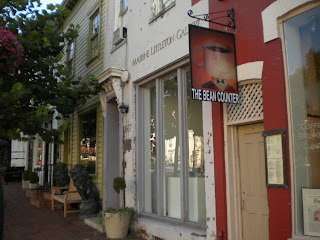 The 2012 exhibition will be held in September at Gallery B, located at 7700 Wisconsin Avenue, Suite E, Bethesda, MD 20814. Winners will be announced September 5. Selected finalists will have their work on display September 1 – 29, 2012 in downtown Bethesda at Gallery B, located at 7700 Wisconsin Avenue, Suite E.The Gallery is located just two blocks from the Bethesda Metro station. The opening reception for The Trawick Prize will take place Friday, September 14 from 6-9pm, in conjunction with the Bethesda Art Walk. Many of the finalists and winners will be on hand to discuss their work. All others, please click Apply Online. See OEAS FAQs (Online Employment Application System FAQs) for help. The Department of Art at Salisbury University is accepting applications for the position of Assistant Professor of Art, Tenure Track to teach Hot Glass. 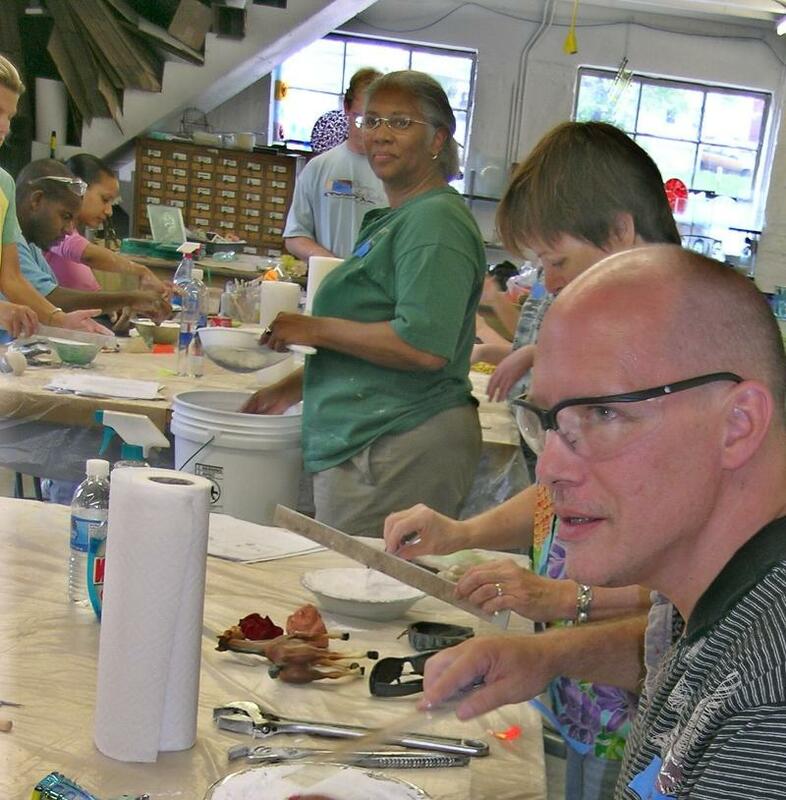 Primary Job Duties: Teaching three hot glass classes per semester with a total of 18 contact hours of teaching per week. Maintain studio, build and maintain equipment in glass, and implement and adhere to safety protocols. Program development for glass, active recruitment of majors, advisement, and departmental committee work are required. Utilize effective teaching and classroom management strategies which enhance the success of diverse learners. 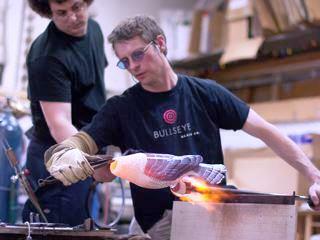 Minimum Qualifications: MFA with an emphasis in hot glass. Preference will be given for prior teaching experience and an active exhibition record. Applications will be accepted via Salisbury University’s Online Employment Application System. 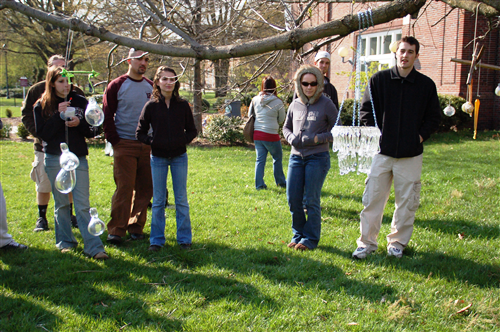 Please visit our website http://www.salisbury.edu/HR/Jobs/ to apply online. See the FAQs of the Online Employment Application System for more information and instructions. To be considered an applicant, you must apply online and submit the following: letter of application, CV, two sample syllabi and a statement of teaching philosophy, exhibition record, graduate and undergraduate transcripts (copies accepted), and the names and contact information of at least five (5) professional references. All other documents that you wish to provide must be attached to your application in the Online Employment Application System. Please do not send any other documents via E-mail. If you have any questions about the position, please contact the Jim Hill, at jkhill@salisbury.edu. Note: Mail CD containing 20 digital images of applicant artwork, and 20 images of student work with size, dates and media of each piece identified. To the Attention: Salisbury University, Art Department, M K Brown, 1101 Camden Avenue, Salisbury, MD 21801. Applications submitted by October 22, 2012 will receive first consideration. The position will remain open until filled. Salary is competitive and commensurate with qualifications and experience. Appointment will be contingent upon verification of eligibility to work in the U.S. and is expected to begin August 15, 2013. This position is based in Salisbury Maryland. 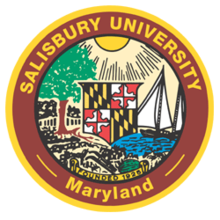 Founded in 1925, Salisbury University is one of 13 institutions that compose the University System of Maryland. Salisbury University is a selective undergraduate institution with the University System of Maryland. The Art Department is a vibrant, fast-growing, collegial department with a full-time faculty of 18 artists and one full-time art historian, with possibly a second tenure-track position in Art History in the near future. The University is close to ocean beaches and the Chesapeake Bay and 2-3 hours from the metropolitan areas of Washington, Baltimore, Philadelphia, and Norfolk. SU has been cited nationally as one of the top ten public regional universities in the North according to the U.S. News and World Report, and has also been recognized by the Princeton Review and Kiplingers magazine. SU has 388 full-time faculty members serving a student population of approximately 8,600. >Get Back to School! 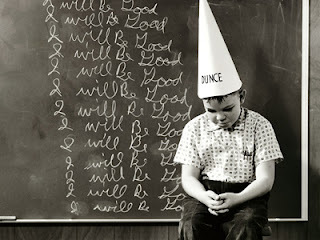 The new class schedule for 2012 is out! Some great new classes – great for for all levels of glass experience. Class 1313 Gravity Drops- Handkerchief Vases & Floral Forms ! with pattern sheets, and embellishments with frit powders and decals! Class 1312 – MIG Welding For Dummies! Ever wondered about learning to weld? Want to impress your friends, your older brother and that cute bartender? It’s easier than you think! In three evenings you will learn how to lay a bead, and handle all sorts of sharp and dangerous tools. You will be able to complete a small project and leave with lots of ideas and know-how for other projects. 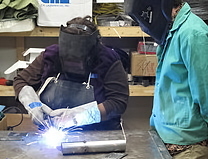 This class will teach you the basics of welding, metal work and design, joining, bending and finishing. And you will get dirty! Are you ready to move past fundamentals, yet still need some more guidance from a professional artist? 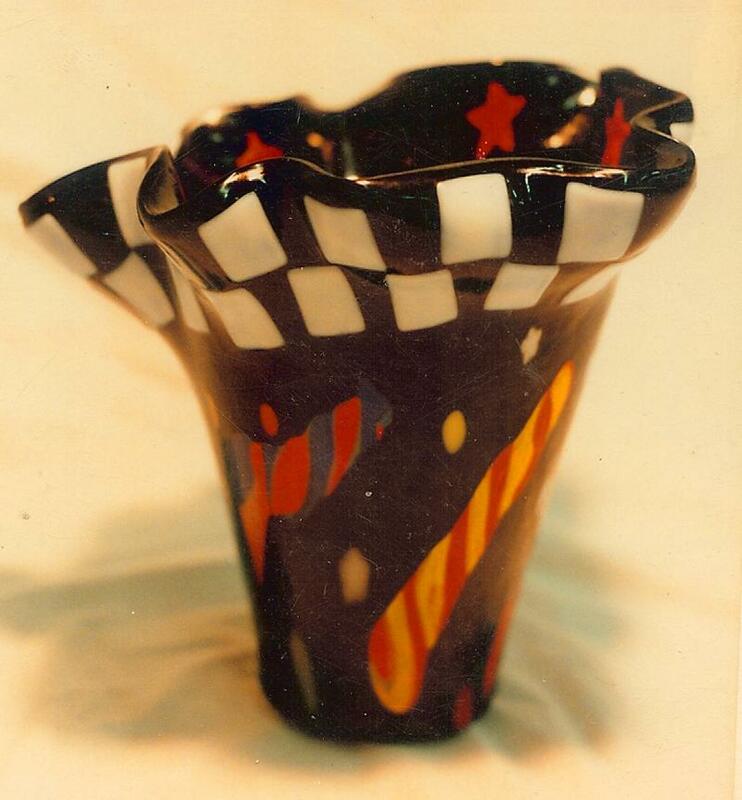 How about taking a course where you will create a vase by using fusing and slumping skills previously learned. 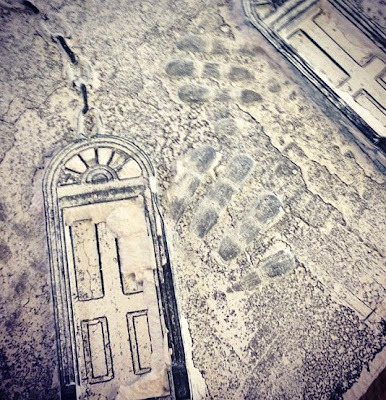 Practice cutting, fusing, and slumping with this two-day class. Students will create a patterned design and then fuse glass together. Day two will consist of cutting the pattern for the slump mold and then allow gravity to take hold of the glass and let it slump into a vase. Class 1314 – More Welding! Now that you’ve tried your hand at MIG welding, the hot glue gun of the metal shop, why not expand your horizons? We will offer a truck load of new techniques. You can compare welding stainless steel vs. aluminum, and pit the plasma cutter vs. oxy-acetylene. 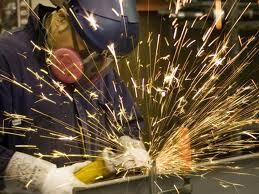 You will also improve your MIG skills, and spend more time on grinding, polishing, finishing and patinas. Bring ideas for a small project and you’ll walk home with it. Remember–this is a filthy, working shop. You will get dirty. Wear closed toed shoes and long pants. Pre-requisite: At least one MIG welding class or equivalent. Class 1315 - Life Casting! 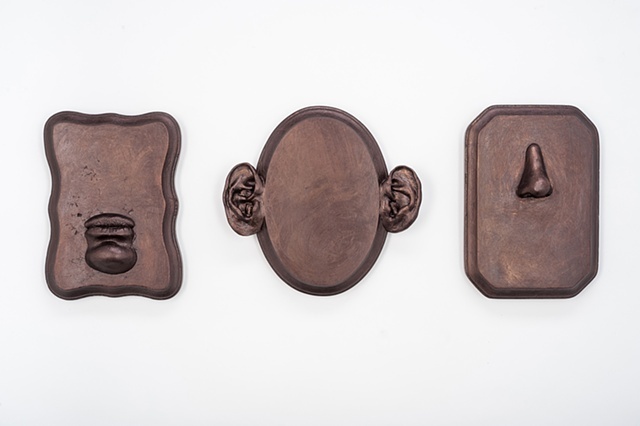 Learn to make molds directly from the human body! This beginners level workshop will teach you the basics of lifecasting! In this class, we will discus different mold materials available to create molds from the human body. 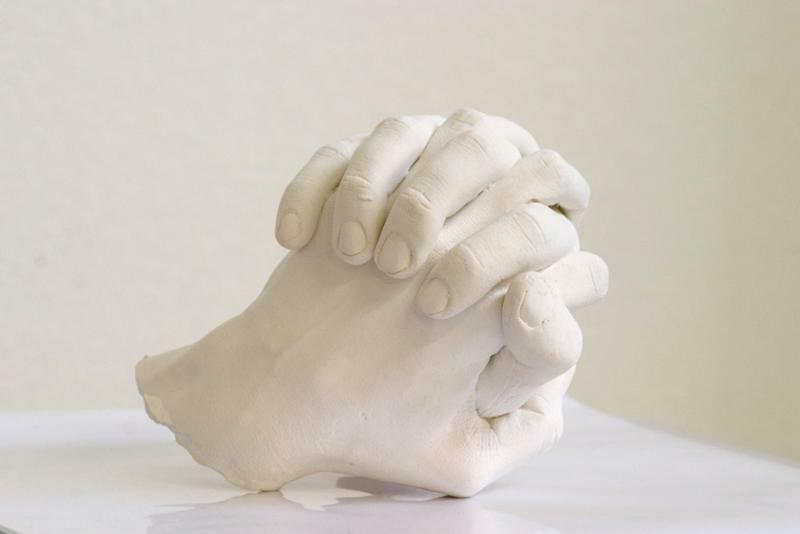 Students will make molds of their hands and faces and create castings in plaster. We will discuss approaches to more complicated life casting projects and possible applications. Deposit for Class Registration, balance due at class time. >How the Washington Glass School is Tied to the War of 1812, The Brits Sacking the White House & The Star Spangled Banner. One of the beauties of being in Washington, DC is the sense of history that surrounds the place. Growing up in northwest suburban Chicago, history seemed to have started after WWII, with suburban subdivisions overtaking farmland. 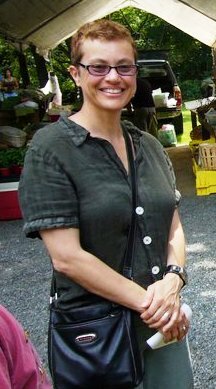 Here, the area is so steeped with the history that appears in grade school books, that important – but deemed lesser – sites can be forgotten; the scurf of yesterdays. As the Maryland area celebrates the Bicentennial of the War of 1812, it is interesting to note that the Washington Glass School building sits atop an important battlefield – one of the key parts in the Battle of Bladensburg. 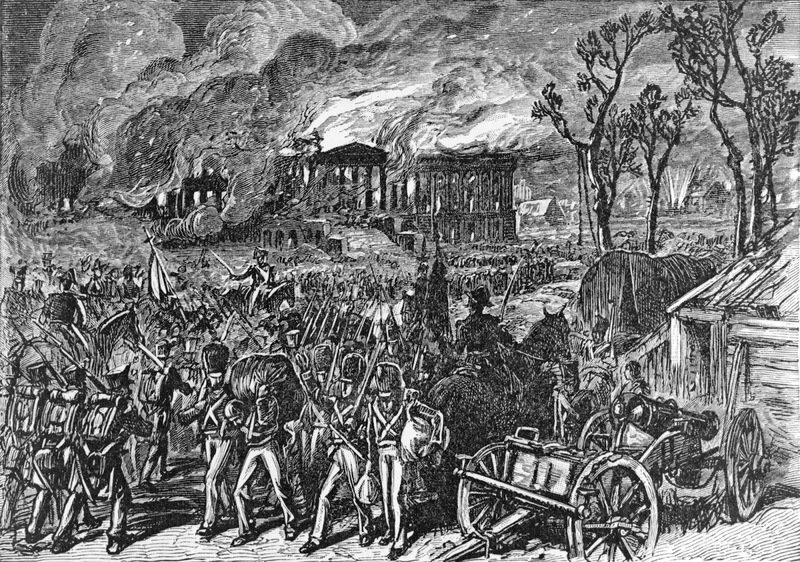 With the US loss at this battle, British forces swept into Capitol Hill and burned the White House, the Capitol and the Treasury. Since there are no signs on the site – this blog will act as a virtual ‘historical marker”. The War of 1812 was a military conflict fought between the United States of America and the British Empire. In these battles, the British set off their new weapon – the Congreve rocket – a rocket carrying about one pound of powder that could travel almost 1,000 yards and their success had a tremendous impact on modern warfare. After the defeat and exile of Napoleon in April 1814, the British were able to send newly available troops and ships to the war with the United States. On August 20, 1814, over 4,500 seasoned British troops landed at the little town of Benedict, MD and marched fifty miles towards Capitol Hill. Incorrect deductions that were drawn gave the Americans the impression that Baltimore was their destination. General Armstrong could not be convinced that Washington would be the target of the invasion and not Baltimore, an important center of commerce. There was much confusion trying to outguess the British. In Bladensburg, MD, American troops began to be assembled by Brigadier General William Winder, the Secretary of War, John Armstrong, as well as the Secretary of State, James Monroe. 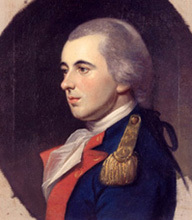 General Smith, another American commander, used his aide – Francis Scott Key – to assemble his troops. 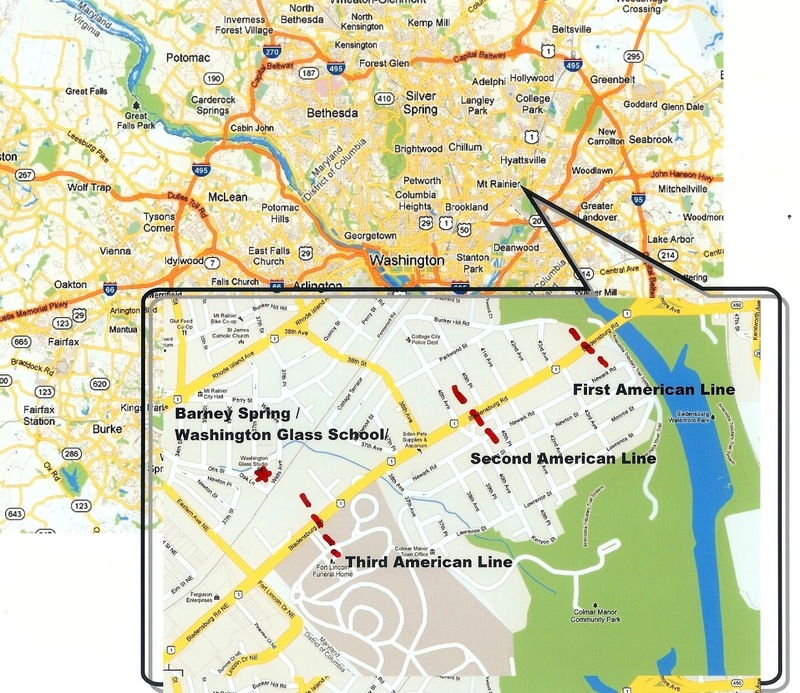 Calvary units were positioned to the right of the main road (now called Bladensburg Ave.), while the first and second American lines were positioned nearly a 1/2 mile apart from each other. The organization (and constant second guessing by commanders) of the troops, the general concern about the size of the British army, and the lack of preparation by the rag-tag militia would eventually lead to the undoing of the hastily assembled group. 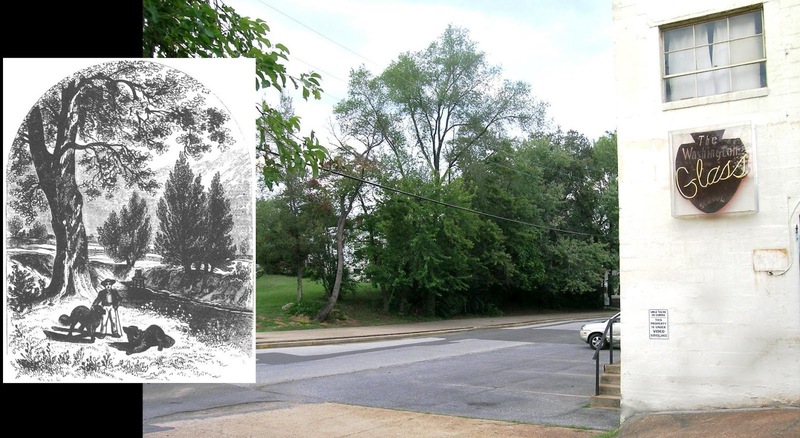 As the British entered the town, they were greeted by the American troops firing the first volleys across the Eastern Branch of the Potomac (now called Anacostia River). The British initially fell back and moved behind the masonry buildings in Bladensburg. Soon though, the British set off their new weapon – the Congreve rocket. These rockets would eventually become the famous “rocket’s red glare.” British troops began to return fire as the rockets burst above the Americans. American leaders on the first line, unclear on their support from the second line, ordered retreat. American soldiers began to fall back and leave the field via the Georgetown Pike (now Bunker Hill Road). The second line, (positioned approximately at the modern 40th - 38th Avenue) and the members of the Cabinet left the field of battle at or before this point. Cannons were left behind, soldiers moved in haphazard movements responding to the need to fight and the orders for retreat. General chaos reigned across the field of battle. General Winder ordered a general retreat. The retreat order was never passed to Barney’s command, but with no ammunition, flanked on the right and deserted on the left, the Commodore knew that the end had come. He ordered the guns spiked and the men to retreat. The officers and men who were able to march effected the retreat; but the Commodore’s wound rendered him unable to move, and he was made prisoner. He died shortly after; but not before he was able to have influence on Francis Scott Key in his efforts to compose the Star Spangled Banner. The building that houses the Washington Glass School is located on the site (now near the intersection of Oak and Otis Street). 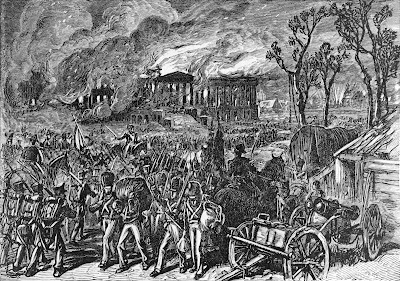 Immediately after the battle, the British sent an advance guard of soldiers to Capitol Hill. The President’s house was burned, and the British raised their Union Flag over Washington. The Brits pillage the White House. The First Lady Dolley Madison remained behind to organize the slaves and staff to save valuables from the British. The buildings housing the Senate and House of Representatives were set ablaze not long after. The interiors of both buildings, which held the Library of Congress, were destroyed, although their thick walls and a torrential rainfall that was caused by a hurricane the following day preserved the exteriors. 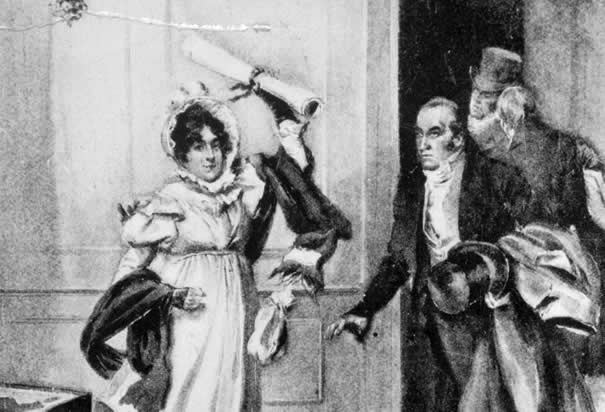 During the war of 1812 when the British attacked Washington DC, The First Lady, Dolley Madison stayed behind in the White House to save the artifacts and symbols of America. The engraving above shows her saving the Declaration of Independence. With their mission accomplished, the British feared the Americans would reassemble their forces and attack while they were in the vulnerable position of being a long distance from their fleet. The men were miserable in the sweltering temperatures. They were tired, ill and wounded. At dusk the troops quietly withdrew from the city. The troops were so exhausted that many died of fatigue on the four day march back to the ships, several deserted, but the body of men marched on. Several of the British stragglers and deserters were arrested by citizens in Maryland. When the British commanders learned of the incident, they sent a small force back to arrest William Beanes, a well respected doctor and town elder. Following his arrest, Georgetown lawyer Francis Scott Key and U.S. Agent for Prisoner Exchange John S. Skinner went to secure Bean’s release from the British. They brought with them letters from British troops who testified as to the compassion that they received while in Bladensburg after the battle. Brought on board one of the British vessels, Francis Scott Key would see the battle in Baltimore raging on and the flag standing at the end of the battle, leading to the writing of the Star Spangled Banner. Times have changed, and we now rely on the Brits as an important and trusted ally – however -the next time representatives from DC Sister City – Sunderland, England comes for a visit to the Glass School, they have some ‘splaining to do. And also – a link to website that shows the archaeology of the Bladensburg battle site.